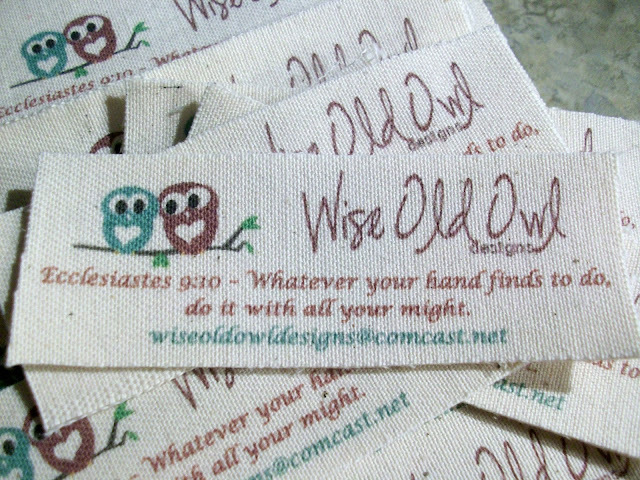 Breathing in Grace: Handmade Labels!!! I've wanted labels to sew into my creations for quite some time....but didn't want to pay "an arm and a leg" for them!!! So.....I made my own!!! I'm far from a "fancy" person....leaning more toward "rustic". All I did was create my labels in a Word document, using the Etsy header Jess made for me. Then, I added the scripture that I've chosen to represent Wise Old Owl Designs....and included my e-mail address. I used Wonder Under to fuse two pieces of muslin, approximately 8.5 x 11....and ran them thru the printer! They're not real crisp and clear....but again, I like the rustic feel. If anyone needs a bit more info, just leave a comment, or send me an e-mail!! !